Atom Man vs. Superman is a 1950 Columbia Pictures film serial and the second Superman movie serial featuring Kirk Alyn as Superman. When Lex Luthor blackmails the city of Metropolis by threatening to destroy the entire community, Perry White, editor of the Daily Planet assigns Lois Lane, Jimmy Olsen and Clark Kent to cover the story. Lex Luthor, the Atom Man, invents a number of deadly devices to plague the city, including a disintegrating machine which can reduce people to their basic atoms and reassemble them in another place. But Superman manages to thwart each scheme. Since Kryptonite can rob Superman of his powers, Luthor decides to create a synthetic Kryptonite and putters about obtaining the necessary ingredients: plutonium, radium and the undefined 'etc.' Luthor places the Kryptonite at the launching of a ship, with Superman in attendance. He is exposed to the Kryptonite and passes out. Superman is taken off in an ambulance driven by Luthor's henchmen, and he is now under the control of Luthor. Superman is placed in a device, a lever is pulled, and the Man of Steel vanishes into "The Empty Doom". Lyle Talbot, who had previously starred as Commissioner Jim Gordon in the 1949 Columbia Serial "Batman and Robin", here portrays Lex Luthor (and also Luthor's alter-ego "Atom Man"). In his "Atom Man" disguise, Talbot as Luthor, utilizes a vaguely German accent and wears an ominous mask fashioned from a "Metallogen Man" robot costume left over from 1945's "The Monster and the Ape". Despite their onscreen personas, Talbot (Lex Luthor), who wore a rubber scalp to create the impression of baldness, and Alyn (Superman) spent much of their time, when not shooting, exchanging recipes; both actors shared an interest in cookery. The final set piece shows Metropolis under attack by "poorly animated" flying saucers and a torpedo. The flying effects were somewhat improved in this film than in the original, by the simple expedient of turning the camera on its side. Kirk Alyn stood with arms raised in front of a cyclorama, while a wind machine and smoke pot were placed above him (out of frame). This gave an inexpensive illusion of flight. Longer shots continued to use cartoon animation of the Man of Steel. In their book The Great Movie Serials, Jim Harman and Donald F. Glut describe the serial as "far more gimmicky and gadget prone" than the first Superman serial. In addition to this, they also found it to be "flawed by the same Katzman cheapness." In 2006, the Atom Man vs. Superman serial was still available for purchase on VHS videotape, where it was first released back in 1989 as a double tape box set. The serial was also offered available in two separate VHS tapes as Volume 1 (Chapters 1 - 7) and Volume 2 (Chapters 8 - 15). 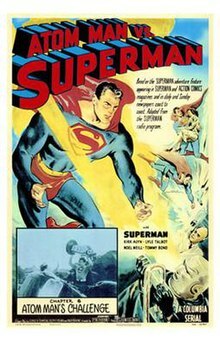 It was officially released on DVD by Warner Home Video, along with its predecessor, 1948's Superman, on November 28, 2006 as Superman - The Theatrical Serials Collection. ^ "Marc Lawrence to Play Heavy". The Cessnock Eagle And South Maitland Recorder. 40, (4083). New South Wales, Australia. 6 November 1951. p. 5. Retrieved 8 March 2016 – via National Library of Australia. ^ a b c d Harmon, Jim; Donald F. Glut (1973). "9.". The Great Movie Serials: Their Sound and Fury. Routledge. pp. 215–217. ISBN 978-0-7130-0097-9. ^ Cline, William C. (1984). "Filmography". In the Nick of Time. McFarland & Company, Inc. pp. 250–251. ISBN 0-7864-0471-X.